Polyisobutylene is an example of synthetic rubber which is mainly used for manufacturing adhesives, agricultural chemicals, electrical fluids, lubricants and fiber optic compounds. Polyisobutylene is used for many applications where an airtight rubber is required such as ball bladders, caulks and sealants, personal care products, for modification of rubber and polymer and for protecting & sealing certain equipment where highly reactive chemicals are stored. Moreover, application of polyisobutylene in manufacturing of inner tubes of tires significantly dominated the market and boosted the growth of polyisobutylene market across the globe. Goldstein Research analyst forecast the global polyisobutylene market size to reach USD 4.51 billion by 2024 and is anticipated to grow at a CAGR of 4.80% during the period 2016-2024. Based on geography, Asia-Pacific is the dominating region for polyisobutylene market growth and is estimated to grow at a CAGR of 4.0%. Latin America region is expected to bring new opportunities for polyisobutylene market owing to generated demand for tires and tubes that makes use of polyisobutylene in automotive industry. On the other hand, Europe is the fastest growing region for market and is anticipated to grow at a CAGR of 4.12% during the forecast period. Based on end-users, the market is dominated by the automotive sector and occupied over 70% share of global polyisobutylene market. Rising number of automotive is fuelling the demand for polyisobutylene tire tubes, hoses, and gaskets. Growing demand as an important automotive component is expected to foster growth of polyisobutylene market during the forecast period. 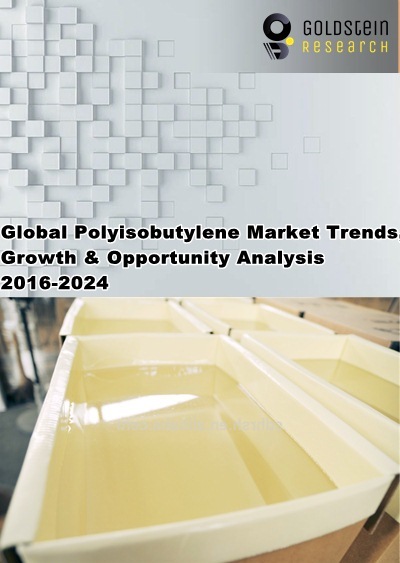 The report covers the present ground scenario and the future growth prospects of the polyisobutylene market for 2016-2024 along with the supply and consumption for the polyisobutylene (PIB) in every region. We calculated the market size and revenue share on the basis of revenue generated from price trends and import & export of polyisobutylene by volume (Million Tons) across the globe. Polyisobutylene Market Outlook 2016-2024, has been prepared based on an in-depth market analysis from industry experts. The report covers the competitive landscape and current position of major players in the global market. The report also includes porter’s five force model, SWOT analysis, company profiling, business strategies of market players and their business models. Global market report also recognizes value chain analysis to understand the cost differentiation to provide competitive advantage to the existing and new entry players. Our global polyisobutylene market report comprises of the following companies as the key players in the Polyisobutylene market: BASF SE, Chevron Oronite, Daelim, Ineos Group, Lubrizol Corporation and TPC Group. Other high-flying vendors in the market are: DOW Corning, Infineum, Braskem, Exxon Mobil, Lanxess AG, Kothari Petrochemicals Limited, ENEOS and Shanndong Hongrui Petrochemical Co. Ltd.
Further, the report states that rising concerns over the transportation of polyisobutylene is hindering the export and import of polyisobutylene. Spilling of polyisobutylene creates negative impact on marine environment and thus government is increasing the regulations over the transportation which is becoming a major challenge for polyisobutylene market growth. What is the total market size by 2024 and what would be the expected growth rate of polyisobutylene market? What are the imports and exports of polyisobutylene in 2015-16 and what would be the expected demand over the forecast period?